The Haru basho is traditionally the big recruiting period in professional sumo, given the end of the school year in Japan. The class of Haru 2007, which will have its hon-basho debut this month May 2007, is no exception: 71 new rikishi will be present. In fact, one could even say 73, since you could count Mori in this class, who, as a makushita tsukedashi, made his debut in March, and Inoue (of Azumazeki beya), who ended up retiring before the banzuke was even published. The large number of young wrestlers in this class is noticeable: 46 are less than 16 years old and are fresh out of school. Also noticeable is the fact that Shikoroyama beya of the former sekiwake Terao seems to have completed its major initial recruitment. With two new recruits, the heya remains far behind Takadagawa beya which leads the recruitment drive with five new rikishi. Finally, take note of the presence of a new foreigner: Dokozan, born in the Philippines, but of Japanese ancestry. The first to have two wins during the mae-zumo trials, a performance which placed him as the top-ranked of the new deshi. It is a remarkable performance for a young man who only played baseball in elementary school. "[As a child], when I ate too much, my parents would often tell me "You're definitely going to enter a sumobeya! ", so I didn't have a good image of sumo. At that time I dreamed of becoming a pro baseball player." 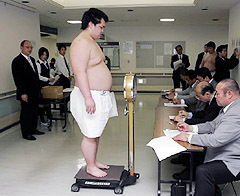 It was in his third year of school, in 2006, that a visit by Taganoura oyakata made him discover sumo: "I was psyched. The bad image I had up to then of sumo just blew away." Right, Masahiro/Takanomiya the older. Left, Sadahiro/Kainomiya, the younger (source: Yomiuri). It's the first time in 14 years that two twins (identical twins) start at the same time in two different heya. Their mother describes the older (Takanomiya) as calm, while the younger (Kainomiya) is nervous. In any case, it was the latter who had the better result during the mae-zumo trials. It is no surprise that their dream is to meet one another during a kettei-sen. 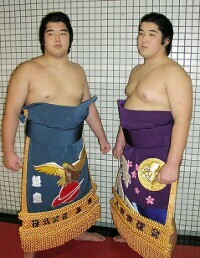 They practiced sumo since the end of elementary school, under the encouragement of their father. Their shikona include the first kanji from their mother's family name (Miyashita). Kainomiya seems more adept at yotsu-zumo and Takanomiya oshi-zumo. The grandson of former juryo Matsueyama, whom he never knew. He started sumo at the age of five, also learning judo since elementary school. At that time, his superior height and strength over a number of other boys of the same age allowed him to reach eighth place in the national competition of wampaku-zumo at the Kokugikan. It was at that moment that Sadogatake oyakata, noticing a style similar to his own at the same age, proposed to him to join his heya after finishing school. University Yokozuna in 2002, he is the departing captain of the sumo team at the Nodai University, with whom he won 4 individual titles. His goal: "quickly catch up to Ichihara (same year in the university) and Mori (who just started as a makushita tsukedashi, 15, coming from Nichidai like Ichihara)." Tosayutaka "who thought of nothing but becoming a pro since school" was embarassed at not having obtained a title, which would have allowed him to start as a tsukedashi like Ichihara and Mori, who are his age and in the same year at the university and whose levels are similar to his own. He will really have to prove himself after a poor showing at mae-zumo, where he finished in the third and last group of the recruits. 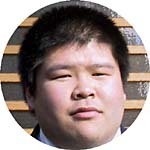 He started sumo in his first year in school, invited by a group which included Tochiozan, who is from the same city and was in the 3rd year in the same school. The two young men find themselves together again at Kasugano beya. In fact, it was in school where he started to think about a career in sumo: "I was influenced by Daiki-san (Toyonoshima, from the same school and who has the same first name, Daiki) who was getting on well despite his small size. You only live once. It's a tough world, but I want to try to rise up to the challenge." Tochiozan and Kasugano oyakata also actively encouraged him to take the leap. 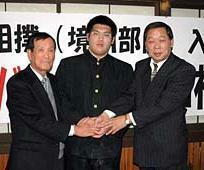 At Kasugano beya he will also rejoin Ri, the school yokozuna who preceded him by one tournament into professional sumo. "There are a lot of very strong guys among my heya-mates so I'm going to work hard to not fall behind. My first goal is to reach the juryo division and to catch up to my sempai." For Kasugano oyakata, "He's still in the raw stage. But he's tough and brilliant. It's important to build his own style starting from zero. I want to take my time to bring up the second makuuchi rikishi from the school of Sukumo." For now, Hamauzu finished mae-zumo among the top of the second group. Tables presenting information on all new recruits can be found in the original issue of PBI (link at the bottom of the page). tables with information on all new recruits.